Look for the leaf! As you peruse our website, you'll find the image which denotes a wood or option which is part of The Cascade Series. From the start of Mya-Moe, we have had top/back/side wood choices which have maximum sustainability, including cherry, walnut, sycamore and myrtle. As we prepared to introduce The Cascade series, we developed an appropriate Signature Headplate (walnut & maple) and rosettes (maple, walnut & pearwood dyed-black). 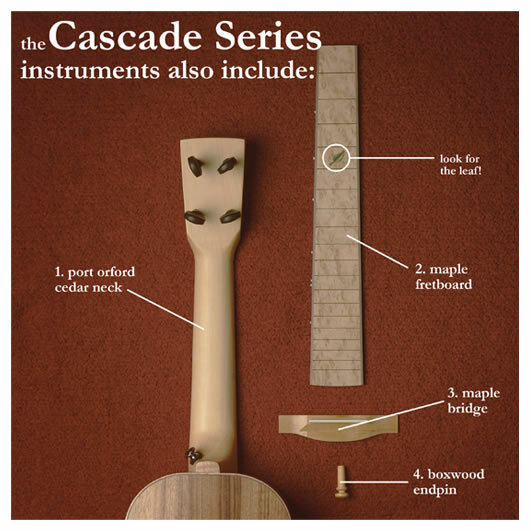 There is no additional charge for a Mya-Moe Cascade Series instrument. We don't think that you should have to pay more to be environmentally conscious. We still want to make you the custom ukulele of your dreams, we just want to do it in a sustainable and responsible way! So naturally, the playability, acoustics and aesthetics of The Cascade Series instruments meet the rigorous standards and goals at Mya-Moe. 1. Port Orford Cedar (POC) Neck: This is a wonderful wood, often used as the top of a ukulele (and classical guitars) and well tested and proven as a neck wood in classical guitars. As with all Mya-Moe ukuleles, the addition of a carbon-fiber reinforcing rod in the neck prevents any possibility of warping or twisting over time. 2. Port Orford Cedar Internal Blocks: We use the "off cuts" from making our necks to make the POC neck and end block that go inside the instrument. 3. Maple Fretboard: We tried several different candidates before settling in on maple. It is a very dense North American hardwood that has been used for years in Fender electric guitars. 4. Maple Bridge: The bridge is an important acoustic element of the instrument, as it transmits the string energy to the top. We chose maple, as with the fretboard, for its high density. In the case of the resonator, Maple is used for the tie-block. 5. Boxwood End Pin: The end pin goes in the end of the instrument and is used to attach a strap. We use boxwood as a replacement for the usual ebony pin. All of our wood is harvested in North America. Compare this with an African or South American log that has to travel so far and change hands many times. This makes our local wood more economical and reduces our carbon footprint. Some pieces of wood are salvaged from other sources, such as bridge timbers and piers. This applies to our beautiful redwood stash! Some of our suppliers harvest downed trees and stumps in order to provide us with coveted old wood without having to cut down more trees. Some pieces are scraps and offcuts from guitar makers and furniture makers. Our suppliers know that we can use the smaller pieces, so they are saved from the scrap heap! We save our own offcuts for artists who make jewelry and other art pieces. Check out our affiliated businesses!